The Draft Project Selection Criteria (version 8), created by members of our Scoping Committee, is a checklist that can be applied to potential properties to see if they fit our scope. It will only let through projects that fit our mission of investing in permanently affordable space for community, small business and cultural use in NYC. Our goal is for all our member-investors to be able to participate in finding the right projects for us. The Draft Project Selection Criteria is like a pair of glasses: when member-investors wear them, opportunities become visible. This brief activity was created by the Steering Committee to help member-investors put on those glasses! These Does It Fit Us? Checklist cards. These are an abridged version of the full Draft Project Selection Criteria and are here and here. Each participant should have one. There are two kinds you can use: These are formatted for double-sided printing, where you cut pages in half and each card is half of a page. These are one-page instead. Does It Fit Us? Sample Projects sheet. This one-page document is here. Or, you can substitute in three real-life potential projects that you think might fit! Each participant should have a copy. A group of people! NYC REIC member-investors, a mission-aligned organization, or a group of neighbors who want to do something to secure community land in their NYC neighborhood. A facilitator (or a few!). The facilitator divides the group into three smaller groups. We did this at our October 26, 2016 All-Member meeting by having our member-investors count off, 1-2-3, 1-2-3. “Ones” go to one part of the room, “twos” to another, “threes” to the other. Each group looks at the Sample Projects sheet, focusing on the sample project that corresponds to their number. They read it together and discuss if they have questions. The goal is to become somewhat well versed in the scenario. In real life, this expert would be someone who lives or works in the neighborhood, or who owns, works in or otherwise uses a space. The facilitator announces that each participant is now to find two others from the other two groups. So if you’re an expert in Sample Project 1, you need to find a 2 and 3. The goal will be for each group to have 1, 2 and 3. Next, participants will take turns applying the checklist to each Sample Project. The Project Expert will present information about their scenario, and the two other members of the group will pretend they are NYC Real Estate Investment Cooperative member-investors with whom the Expert is acquainted. At this point, it helps to get imaginative. Think about what kind of situation that might lead to your conversation! Take Sample Project 1 for example: you might pretend that the Project Expert is a longtime member of the church’s congregation, and that the two other members of the group are newer to the neighborhood. They all just finished volunteering for the third week in a row, during which the Project Expert shared a bit of her vision for the vacant building. It’s Saturday, and you three just finished volunteering. Now you are sitting on the bench outside, enjoying the incredible fall light. One NYC Real Estate Investment Cooperative member might say to the Sample Project Expert: “Hey! I have an idea you might be interested in. Remember how you were describing to me the community space you want to create at that vacant public building? Maybe we can work together. I’m a member-investor in the NYC Real Estate Investment Cooperative, and we are looking to invest in properties that we can keep permanently affordable and in community hands, through legal mechanisms!” The Project Expert, a little surprised, might say, “Really?” And you might say, “Really!” and then they might say, “Well how do we know if it will work” and that’s when the two NYC REIC members pull out their cards and say: well, let’s see! Then, the two member-investors begin to vet the Sample Project. When it’s unclear if it fits, use this as an opportunity to discuss how it could fit. This way, the Selection Criteria is not just a checklist for already defined ideas, but a tool to help groups plan how they could use their spaces. The facilitator lets participants know when it is time to switch between vetting Sample Project 1, 2 and then 3. The facilitator brings the whole group back together, and leads a debriefing conversation. What did folks think of the activity? Did the Sample Projects fit the checklist? Did the checklist help generate new ideas for Sample Projects? 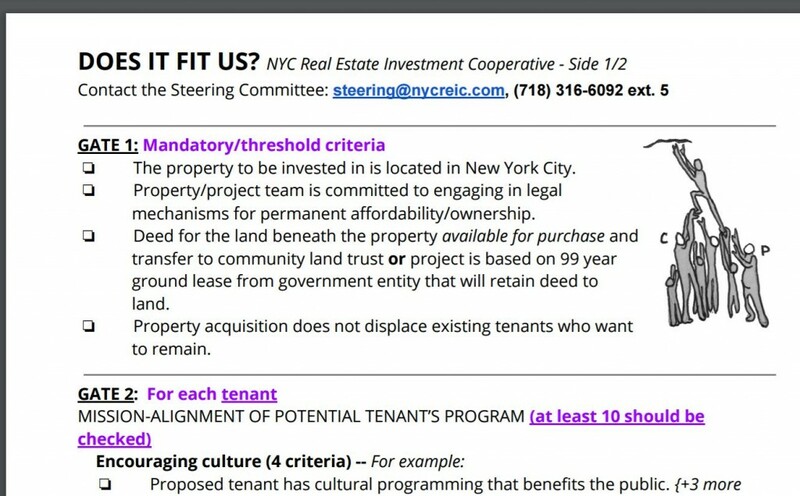 Are folks clearer on what the NYC REIC is looking to invest in? The facilitator then invites participants to take the materials home with them. Bring them to your community group, your cousin, your favorite cooperative business, the local laundromat, the corner store/community hub, the social entrepreneurs and local organizers you believe in! Make sure they know where to find the full Draft Project Selection Criteria: http://tinyurl.com/projects4nycreic – and that they can contact the Steering Committee if they have a great project in mind and want to discuss: steering@nycreic.com or (718) 316-6092 ext 5.